As you may have found out from visiting my blog in the past, I am a HUGE fan of the Throne of Glass series by Sarah J. Maas. I first bought Throne of Glass on a whim two years ago. Once I read it I fell completely in love with the world and the characters. I already wrote a post with 10 reasons why, so you can always check that out if you want! So OF COURSE I have been anxiously anticipating the release of the 5th book in this series, Empire of Storms. Actually, anxiously anticipating feels like a major understatement. I NEED THIS BOOK SO MUCH it’s driving me crazy. Let me just quickly say that this post will be completely spoiler-free for Empire of Storms. I know some bookstores had the book ahead of publication which means that some people have already read it. I have not. I have been avoiding spoilers like the plague but I did get accidentally spoiled on one thing (Side note: guys, come on. Even if you don’t post a spoiler yourself – liking a spoiler on Twitter or Goodreads means your followers will still see it. Please just don’t do that.) I am choosing to completely ignore that spoiler here though, so this post is SAFE for you. These are just my non-spoilery predictions and speculations. Let’s see how many I end up getting right! Warning: Though this is spoiler-free for Empire of Storms, there are of course still spoilers for books 1-4 in this series because this is already book number 5. So if you still have to start this series, please ignore this post. Thank you! Remember Nox, the nice thief and friend to Celaena in Throne of Glass? I’m pretty sure we will see him again. Why am I so sure? The guy is from Perranth. Perranth is a city in Terrasen. And where are Aelin and her gang headed? You got it, Terrasen! 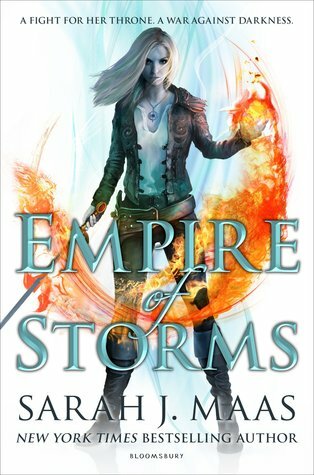 We already had a lot of character development for Manon, but I think Empire of Storms will bring on the heartbreak for her (proving she does indeed have one). I think either her budding relationship with Dorian, be it friendly or romantically, or her connection to Asterin or even Elide will rub her grandmother the wrong way and cause her to punish Manon. I fear she will lash out by killing someone Manon loves, perhaps Asterin or another member of the Thirteen. (Maybe even Dorian, but if she hurts Dorian, I will go after the old witch myself!) Either way, it will cause Manon to finally turn her back on her grandmother and take control of all witch covens herself. Yes, I know, again Manon. She’s one of my favorite characters, can you tell? Anyway, it’s time to finally find out what’s so special about Manon’s eyes, and why she could reach Dorian when he was possessed and why she could smell and taste things were wrong when the other witches couldn’t. I have no idea why that could be, but I’m sure we’ll find out now! Bonus Manon-related prediction: we will get some great Abraxos scenes with him being cute and smelling flowers and being just awesome in general. I guess this is an easy one. Elide is on her way with the wyrdkey, so unless something goes very, very wrong on her way, she will reach Aelin and we will have another long-awaited reunion. Elide will then become a part of Aelin’s court and become a sort of spokesperson for the witches. (Manon’s witches anyway). I feel like this has been teased for such a long time, so it would be a surprise if we don’t get any steamy scenes. ACOMAF proved that Sarah J. Maas can really write those scenes, so I’m sure this will come to play in Empire of Storms as well. Also, I think the concepts of ‘mate’ and/or ‘immortality’ will come into play. Either Aelin and Rowan will find out they’re mates, or Rowan will give up his immortality by binding it to Aelin. With Chaol and Nesryn heading to the healers of the Southern continent to find a way to make Chaol be able to walk again, the chance is pretty high we will encounter Yrene. Yrene was headed to study with the healers in The Assassin’s Blade anyway so she may even end up being the one to heal Chaol. And I’m sure he will be healed because I just want him to be happy. Please, just make him happy Sarah, he has suffered enough! This is one prediction that I really don’t like, but I’m still afraid it will be the case. With Aelin in Terrasen, Dorian in Adarlan and Chaol at the Southern Continent, I don’t think there will be any interaction between our original trio. And I love me some Aelin-Dorian-Chaol, so this will really pain me… Maybe we can at least find an excuse for Dorian to visit Terrasen? With the king of Adarlan defeated and Aelin heading back to Terrasen, I think the Ashryvers will reach out to her. And while she may be hesitant at first (they have been ignoring Terrasen for years after all), I think that in the end Aelin will see the bigger picture and do everything she can to defeat Erawan, including working together with the Wendlyn royal family. Things just don’t seem to add up just yet. I’m sure he’s a really bad guy, but I don’t believe yet he’s THE Bad Guy. I don’t know, I’m still thinking maybe it’s Hollin, Dorian’s little brother. Or someone else we’ve already seen but are currently sooo not expecting. 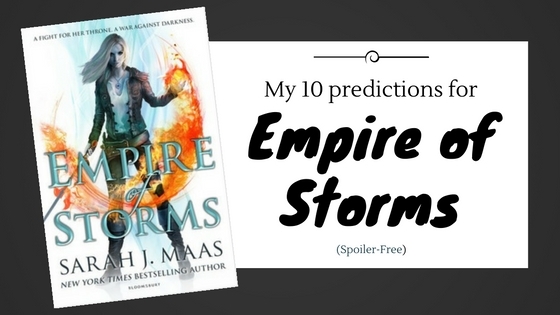 What are your Empire of Storms predictions? Do you agree with some of mine? If you’ve already read the book, please don’t put any spoilers in the comments though!